Thurles Shopping Centre's 20th Birthday! Thurles Shopping Centre and its 25 retail units are celebrating its 20th Birthday and we want to invite you to join us on Saturday 7th October, for a fun-filled day of GIVEAWAYS, MASSIVE DISCOUNTS and a programme of free entertainment! Thurles Shopping Centre are looking forward to rewarding some of our loyal customers as we celebrate 20 years in business. Along with giveaways on the day there will be massive discounts from retailers for one day only, as well as the Tippfm crew who will be broadcasting live from the centre throughout the day. 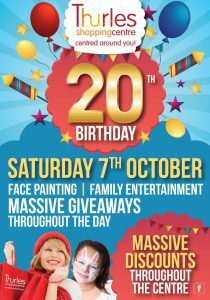 So remember to join us for our massive 20th Birthday giveaway celebration on Saturday 7th October at Thurles Shopping Centre.